“A Short History of the Department of State” has been retired and is no longer maintained. For more information, please see the full notice. 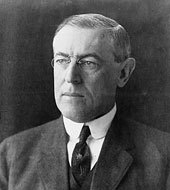 The entry of the United States into the First World War in April 1917 as an “associate”—not ally—of the Allies, was more than just a response to submarine warfare; it also reflected the vision of President Woodrow Wilson. By 1917, the war had grown into a quasi-global conflict, verging on total war and completely unlike any conflict before it. Wilson thought that the United States alone could shape an effective peace settlement because he believed that the combatants were politically and morally bankrupt. Wilson felt that American intervention in 1917 would ensure that the United States would play a decisive role and dominate the postwar peace conference. The President's plan for the future, outlined in the “Fourteen Points” (January 1918) and augmented by later pronouncements, envisioned restoration of a stable, equitable, and enduring international balance through a new collective security organization, the League of Nations, based on a consensus of the great powers. Due in large part to Wilson's vision, the United States had changed course from isolation toward engagement.